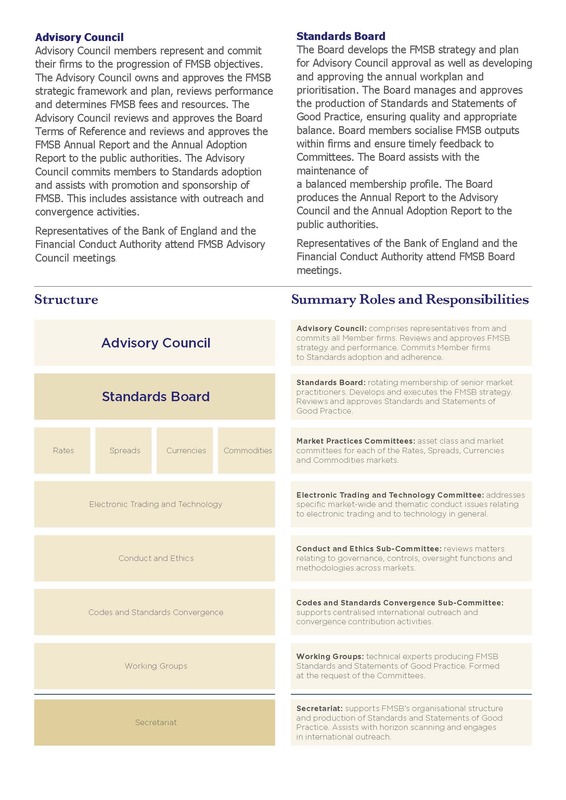 What is the FICC Markets Standards Board? The FICC Markets Standards Board (“FMSB”) was established in 2015 as a private sector response to the Conduct problems revealed in global wholesale Fixed Income Currencies and Commodities (“FICC”) markets after the financial crisis. FMSB has only one ambition: to help raise standards of conduct in global wholesale markets and thereby make those markets more transparent, fair and effective. Our membership is designed to be representative of the entire wholesale FICC market. Our outputs are voluntary Standards and other guidance, developed by our membership and designed to illustrate best practice to all market participants, in areas of uncertainty. These Standards are intended to reduce the continuing uncertainty about acceptable practice in opaque and unregulated areas, which is a hazard for FMSB Members (and other market participants). We believe that Standards can be developed quickly and pre-emptively, adopted rapidly and align naturally with the new regulatory approach to behaviour, conduct, compliance, culture and governance. We are open and consultative: we work with any national and international body interested in our work, we avoid any duplication and overlap and share our thinking and output with any other organisation worldwide wishing to use, adopt or copy our materials. FMSB is is not a Regulator, an SRO, a Trade Association, a Lobby Group, a Consultant or Legal Advisor; nor are we competing with any of these organisations. FMSB does not produce rules, laws or codes and we have no statutory or regulatory authority. Regulators comment on draft Standards but do not approve them: approval is given by the FMSB Board.